Between the gentle trade winds and the thriving tourist trade, the year-round summer days and the languid nights, the living is easy in Key West. That's just the way P.I. Gideon Lowry likes it. These days, when he's not bird-dogging AWOL witnesses for the state attorney's office, Gideon's at the keyboard, giving them Gershwin and Porter to chase away the blues and help chase down the booze. That's where Virginia Murphy finds him. Shrouded in somber white, she's come back to Key West to lay a real ghost to rest - by finding out who murdered her sister, Lila, nearly 40 years before. For Gideon, it's a gig that leads him down the darker side of memory lane - where haunting snatches of his own past, like the timeless melodies he plays, linger on. Secrets linger there, too. But they're buried as deeply as the paradise that was Florida's landscape, now entombed beneath the concrete of Bayard Cement. That ubiquitous family business - and the wealthy, influential clan behind it - are a wall that Gideon slams up against harder and harder as he investigates his hometown's hidden history. That's when Gideon takes the pledge - to unlock the shocking truth that Key West has concealed too long beneath its sunny, sultry surface, and to face a killer's music and dance. I liked this story because it made me nostalgic for the hard boiled detective stories that I used to love reading growing up. Raymond Chandler, Dashiell Hammett, et al. And the narrator, David A. Wood, read with the same style as Bogart did in his voice overs of the black and white movies that make me equally nostalgic. Other reviewers that may have thought the narrator sounded bored may not be old enough to understand that hard boiled detectives have that world-weary ennui that often plagues detectives who have just seen too much of human nature's dark side. It's what makes them hard boiled, for gosh sakes! It's what makes the genre great. Although I was provided this copy by the author, narrator or publisher in exchange for an unbiased review, I became an instant fan of this series and plan to pursue more by John Leslie. This story was as familial and complex as noirish story like Chinatown. It seemed straightforward at first, but it got deeper and more complicated as the story unfolded. If you're a fan of old school detective fiction, you will love this. If you wouldn't know a hard boiled detective from a hard boiled egg, then I suggest you try another genre. Although I found so much sorrow in this book, I found the storyline excellent and truly enjoyed every minute of it. I received this audiobook from the author, narrator or publisher for free and am freely offering my honest, unbiased opinion with this review. This was a great mystery. I thought I had figured out who done it but I was wrong!! I highly recommend reading/listening to this book. Gideon Lowry has been soldier, fisherman, fireman and cop but is now a piano-playing private investigator in Key West. When he is hired by the sister of a woman that was murdered in the 50's, he begins to suspect that the case has intentionally been swept under the rug. When people start dying, he's sure of it. Someone doesn't want Gideon to solve the case. But who? Killing Me Softly is a well written story with plenty of interesting characters. Gideon is a flawed character and the case brings up a lot of old memories for him. Dealing with the daily struggle of alcoholism doesn't make his job any easier. I found this to be a very entertaining listen and the narrator immediately drew me in. There was enough going on in the story to keep my interest all the way to the end. Every time I thought I knew who the culprit was, I kept saying to myself "nope, wrong again". This one really kept me guessing and I loved the twists and turns along the way. 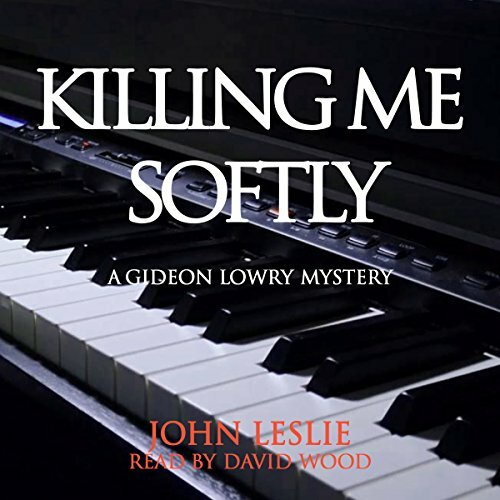 I would recommend Killing Me Softly: Gideon Lowry Key West Mysteries, Book 1. 4. Hot humid Southern clime,check I guess the only thing missing was A side kick like Clete Purcelle. That being said, this book was a worthy effort that I enjoyed very much and I am sure the ending will give you that, "I didn't see that coming!." experience.I will look for the next installment of John Leslie's Gideon Lowry Key West Mysteries and would be happy to see David A. Wood Narrating. I was voluntarily provided this free review copy audiobook by the author, narrator, or publisher. Where does Killing Me Softly rank among all the audiobooks you’ve listened to so far? What other book might you compare Killing Me Softly to and why? Jonnie Jacobs books are similar in twists and turns to hold your attention throughout. A touching moment when Gideon finds out his brother, Carl, has 6 months to live. A former police officer, now PI piano player takes on a cold murder case. There are many suspects but witnesses are few. Lots of twists and plenty of suspense. I look forward to more in this series. The narration was well done. The characters were well portrayed. David A. Wood gives a good performance. What made the experience of listening to Killing Me Softly the most enjoyable? The writing and story were interesting. The time period, wasn't the "usual" as many mysteries are. I haven't so I can't draw a comparison, but I enjoyed his vocal interpretation here. A clear voice easily understood. Not any hokey attempts at odd voices "just to be different"! These are assets in my mind. It kept me entertained! I cared about the main character, Gideon and how he goes about his function in the story. I liked the time frame as it relates to Key West. This was a very well done audio book project. Writing, and narration are very well done. I'm having a tough time deciding where to begin a review of this book. Normally, I'd try to say something nice, so here goes: the supporting characters were an interesting lot (too bad two of them are killed off). Gideon himself, not so much. Yeah, he's sentimental, and loyal, but I found him tedious and annoying for the most part, lurching from scene to scene until the cold case is resolved. The sub-theme of his coming to terms with his alcoholism struck me as clunky; then again, I wasn't all that invested in the girlfriend helping him with it either. By the end, I was feeling some sympathy for the villainous (according to Gideon) Bayard clan, whom he was pursuing (harassing). The Key West setting seemed tacked on to me, could've been Hilton Head or Padre Island in the "old" days almost as well. Moreover, by the 1990's the place had become a gay mecca, yet that's barely indicated at all, aside from a death at a lesbian guesthouse and a remark early on that Gideon's family home was now a gay male one. One item I found irritating about the narration were mentions of a "conch" accent, yet to me no one of all those locals ("our" people) had one. Gideon's brother, frankly, sounded more like he was from Illinois. Otherwise, for much of the story I felt the narrator wasn't doing enough to carry the story, until deciding that he did about the best he could with the underlying material. I liked this first-person story. It was predictable but it was also very good. A flawed former police officer, who earns money as a pianist (nice!) and moonlights as a PI, migrates through the mire of his complicated familial past while trudging through the muddy waters of a motley of characters, the lives of whom are intermingled with his own under a gnarly tangle of secrets and deceit. The backdrop locale being "the southernmost city in the United States" was a nice touch-- not at all from the POV of vacation and tourists-- but rather the grunt, grind and ill-histories associated with local families, law enforcement, judges, and politicians. My one notable gripe is that there were several distracting instances of set-up dialogue, a tool comedians use right before delivering a punch line, but intended here to add profundity. Each time the technique was engaged, I was tempted to hold up my wrist, time an imaginary second hand as it ticked around the face of an imaginary watch and say... "Wait for it ... Here it comes." One or two of these rimshot drum-tap zingers is okay, but when a sea of dialogue is littered with them, it can toss you right out the tale. Sometimes it's best to let the story be the story. Still, it was well-worth the read/listen. While the writer did a good job at unfurling the yarn, the narrator read with the passion of an unenthused news reporter. Overall, his characterizations of most of the personalities were actually good, but he seemed disconnected from the story as a whole, and specifically, from the protagonist's role. Too bad. The author or narrator gifted this book in exchange for a review.